Part of me thinks it took so long to draw this map because parts of the island are physically impossible (walking upstairs to an underwater room after having been right next to an opening to the outside air down below). Another part of me didn't want to draw the map right away because doing so would sever some last tie I had to Riven (though there's always the overall map of the 5 islands and transports). 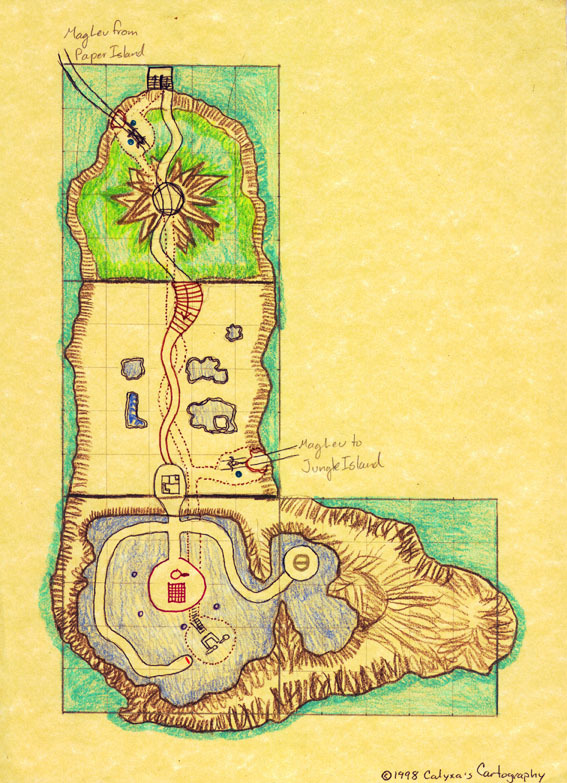 Whatever those reasons were, they weren't enough to keep me from finally drawing a map of this island. Map grid, rotating control and map room outlined in red. Underwater/underground chair drawn in dark grey. Small purple circles are the Wahrk totems, I could only find four of them, though others have speculated that there should be one for each underwater light. There are no underwater lights indicated on my map, nor did I indicate the colors of each totem, though none of them are red. The shape of the balcony has been altered to accomodate the drawing of the button diagram. Pathways with semi-frequent cross-hatches indicate stairs. Where there are stairs, an arrow points up to the top of the staircase. Ladders are short black lines with dots at either end. A small blue circle with an illegible M in it is a mag-lev-summon button. If you want to be looking at the above legend info at the same time you view the map, remember that both of the "big two" browsers will let you have a "new window with this link".